We entered 2009 with great hopes for change, knowing that instead of waiting for our leaders to change the world for us—we need to create change ourselves. We high-kicked the year off at the Inauguration, performing “Yes we can can end war” dances all around Washington, D.C. as we passed out thousands of pink ribbons to remind Obama of his campaign promises for peace—and we haven't let up. As 2009 comes to a close—a year that saw unrest both at home, with the economic crisis and the chaos surrounding health care reform, and abroad, from the devastating plight of Iraqi refugees, to the destruction of Gaza, to fraudulent (yet mobilizing) elections in Iran and the deepening quagmire in Afghanistan—we want to thank you for being part of our vital movement, our peace family. In 2010, we will continue to urge Obama to truly earn his Nobel Peace Prize by keeping his original promises for peace and change, and we will continue to model to the world what real change can look like. 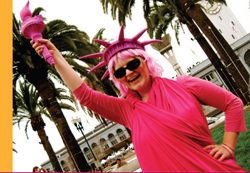 When Congress was holding hearings on the bailout, CODEPINK flooded the halls of Congress, bringing the Main Street voice into every meeting. Our visuals made the front page news around the world! Jocelyne Voltaire, a Queens woman who was about to lose her house in 2008, but was supported by your generosity, has been able to stay in her home. At our 24-hour Mother's Day White House vigil, we created a giant knitted “cozy” to wrap the White House fence with a message inspired by the Mother's Day Proclamation. Our “We will not raise our children to kill another mother's child” banner was made with 7,000 knitted squares from around the world. Women sang, danced, shared skills—we closed by weaving over 1,000 roses into the White House fence, bringing beauty to our vision of a more peaceful world. CHANGE IS… Saying NO to Escalation! Obama's promise to escalate troops in Afghanistan is one we don't want him to keep. To oppose the troop surges and to memorialize eight years of war, our National Media Week of Action resulted in dozens of articles and blogs placed nationwide. October's delegation to Afghanistan to meet with Afghan women and hear their perspectives generated more awareness-raising at home. The next month, we co-sponsored two Afghan women's US speaking tours, Zoya from RAWA, and former Afghan MP, Malalai Joya. To drive the message home, cofounder Jodie Evans hand-delivered a petition to Obama signed by Afghan women leaders speaking out against the surge. CHANGE IS… Healthcare not Warfare! We joined the national movement for single-payer healthcare reform to show what redirecting our resources into life-affirming activities can look like. We spoke out at dozens of town hall meetings, sit-ins, marches, and congressional education days. Stolen Beauty: Boycott Ahava! In June, we joined our Israeli and Palestinian sisters in their call for increased economic pressure on Israel to respect human rights and international law. We launched our boycott of Ahava Dead Sea cosmetics with a protest action at the Tel Aviv Hilton where we shut down the Ahava store with just bikinis and mud! To date, we have successfully pressured Ahava's spokeswoman, actress Kristin Davis, to allow her contract to lapse, and Stolen Beauty inspired actions have been organized in France, Canada, Austria and the UK. We redesigned WomenSayNoToWar.org to provide you with a portal to our work throughout the Middle East and the Afghanistan-Pakistan area. Check out videos, blogs and articles on critical issues. Our netroots have also blossomed this year with over 16k new members on Facebook and almost $20k raised to date in support of our International Women's Day gifts to women in Gaza, and so much more! We also tweet for peace daily with our 2k followers! #pink #peace #women. From confronting Donald Rumsfeld at the White House Press Correspondents Dinner in DC to almost handcuffing Karl Rove twice in San Francisco and in NYC, to weekly vigils at torture professor John Yoo's Berkeley home, we are determined to hold the former administration accountable, serving up citizens' arrests and keeping on the trail as these war criminals attend high paying gigs instead of heading for the Hague. Cuff ‘em! From Earth Day to the climate change conference in Copenhagen, CODEPINKers joined environmental activists in calling for bold climate action to stop global warming and curtail oil use. We brought attention to the heavy environmental costs of war and militarism, especially from the world's largest polluter, the US military. CODEPINKers also turned up the heat by participating in 350.org photo ops, Greenfestivals, Chevron protests, and colorful direct actions. 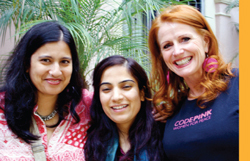 This year, CODEPINK led peace-building delegations to Iran, Israel/Palestine and Honduras, in addition to Afghanistan. Community building is part of our vision for a healthy planet—bringing the personal stories of Iranians, Palestinians, Afghans and Hondurans back to the US is priceless. And for those who couldn't join the delegations, our local groups coordinated book clubs focusing on Afghanistan, to help us better understand the people, their history, culture, and the US role in the region. From Florida to Wyoming to California, CODEPINKers joined coalition marches, rallies, candlelight vigils, and direct actions to vocalize outrage about the continued US occupation of Iraq, marking six years since the bombing began. We welcomed 15 new local groups to the CODEPINK family which sprouted up in small towns and big cities from Bismarck, ND, to Boston, MA. Each month, we feature over 20 local actions on our website; almost every day, someone somewhere is doing something splashy in pink for peace! In August, San Luis Obispo CODEPINK hosted a west coast CODEPINK retreat where 100 women came together to educate, rejuvenate, and activate together. In September, the G-20 conference in Pittsburgh drew international attention and CODEPINK Pittsburgh co-organized a two-day Women's Tent City to highlight the plight of refugees of war, despite repeated permit denials from the city. CODEPINK NYC has been working with a broad coalition of students, teachers, parents and local Congresspersons to educate all about harmful military recruitment tactics and the power of opting out! Chicago CODEPINK continues their work with local Iraqi refugee communities—helping them find much-needed services, raise funds, share their stories and find community. 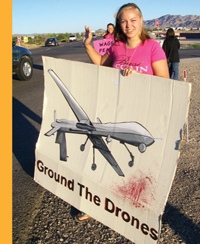 Bay Area CODEPINKers have organized awareness-raising campaigns and two protest encampments outside the Creech Air Force Base in Nevada, the launch-site of the unmanned robotic air strikes which have killed innocent civilians in Pakistan and Afghanistan. Ground the Killer Drones! As part of our work to support Peace in Israel and Palestine, we co-hosted two 19-year-old women Israeli war resisters on a national speaking tour to share their stories of why they refused service in the Israeli army—instead serving jail time for their convictions and bravely organizing for justice and peace. These young women visited ten states, and 26 colleges—57 powerful events in just 30 days! CHANGE IS…Lifting the Siege on Gaza! 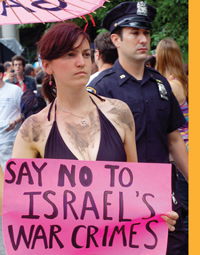 Rapidly responding to the horrific 22-day Israeli assault on Gaza, CODEPINK organized seven delegations to Gaza. We brought humanitarian aid funded by your donations and CODEPINK local house parties. We delivered over 1,000 gift baskets on International Women's Day in March, clowned with Dr. Patch Adams and built pink playgrounds in May, bore witness to the wanton destruction of colleges, hospitals, and daily life of Palestinians in Gaza, delivered a letter from Hamas to Obama, and built people-to-people ties with organizations and families in Gaza. Thanks to the overwhelming amount of support we have received, we will end the year by joining the International Coalition to End the Illegal Siege of Gaza. 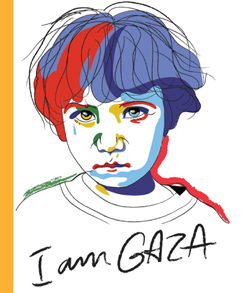 Together, we are mobilizing a historic march alongside the people of Gaza to breach Israel's illegal blockade. Thanks to your outreach, our international contingent of supporters is growing everyday!